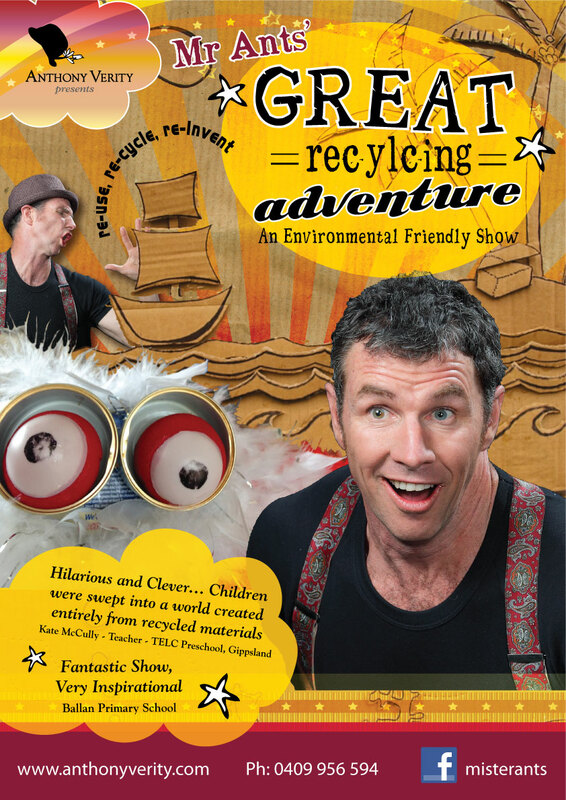 This Show is great for Preschool and Junior School children alike! Armed with a bag of re-cycled boxes and objects MisterAnts’ mission is to create a show using the children as the actors. The Show is created entirely from re-cycled cardboard, news paper, plastic, tin cans and second hand things lying around… all crafted into simple props, puppets and backdrop panels . This entry was posted in Family Shows, Kids Shows and tagged 3-8 years, Anthony Verity, childrens theatre, Clown, Comedy, fun, hillarious, magic, Melbourne, Mime, MisterAnts, physical theatre, Show, silly, splapstick, Victoria. Bookmark the permalink.